Once upon a time — a long, long time ago — the world of art museums was a relatively quiet, scholarly domain of academic pursuit and aesthetic contemplation. I am talking about the times when blockbuster exhibitions were not yet invented, and visitors would come to museums primarily to enjoy permanent collections and, on occasion, to check out a temporary exhibition. Of course, part of the attraction of going to the Louvre or the Hermitage is the architectural glamour of its setting, but the main reason has always been to experience the enigmatic smile of Leonardo's Mona Lisa in Paris or marvel at the astonishing collection of Rembrandt and Rubens in St. Petersburg. Then in the 1970's Thomas Hoving, director of the Metropolitan Museum of Art, came with an idea of "King Tut," a blockbuster exhibition which brought a record numbers of visitors and plenty of revenue. And all of a sudden, a museum's success or failure started to be judged by numbers — the number of visitors, and number of dollars they spent. At the beginning of the new millennium, thirty years after the King Tut extravaganza, a new craze took over the museum world; this one became known as the Bilbao effect. Frank Gehry's outstanding, visionary architecture for this museum in Bilbao, Spain, turned the sleepy provincial city into a cultural destination. The new mantra for the major museums around the world has become, "if you build it, they will come." Therefore museum trustees began hunting for winners of the prestigious Pritzker Architecture Prize, the so-called "starchitects" capable of delivering eye-catching design for their museum projects. Twelve years ago, LACMA embarked on an ambitious plan to replace its "mismatched" museum pavilions with a grand scheme by Rem Koolhaas, who proposed an impressive one-story building under a curving glass roof. I remember debating the practicality of such a feature with LACMA's then-director Andrea Rich, expressing my doubts on the wisdom of flooding the museum with so much light considering that most of the museum artifacts on display require careful protection from light exposure. I finished my interview with Ms. Rich by asking her, "Andrea, at the end of the day, who is going to be responsible for cleaning the pigeon poop from this glass roof?" A few months later, this $300 million project was abandoned, but last week LACMA's current director Michael Govan made a surprise announcement that he and his trustees are embarking on an even more ambitious project — this time costing $650 million. And again, most of the existing museum pavilions will be replaced by a single shiny glass structure designed by renowned Swiss architect Peter Zumthor, yet another Pritzker Prize winner. Meanwhile, nothing in this latest proposal indicates a particular interest in enriching this encyclopedic museum's permanent collections. But let's stay tuned and save our judgments until the small retrospective of Zumthor's work, including his proposal for LACMA, opens in the Resnick Pavilion on June 9. If the Los Angeles Museum of Contemporary Art hasn't had enough trouble in recent months, here's the latest bomb, this one dropped by Frank Gehry who announced his last-minute withdrawal from the upcoming survey at MOCA devoted to exploring the last 25 years of Los Angeles architecture. Mr. Gehry says that he is unhappy with the less-than-scholarly curatorial approach of the museum's guest curator Christopher Mount, but the question is, why wait until the last minute to make such a momentous decision and thus risk the cancellation of the whole show? I am holding in my hands an already-published, very attractive catalog of this at-risk show and feel sorry for all the other architects who — if the exhibition were cancelled — would be denied the acknowledgement and respect this exhibition intended to give them. 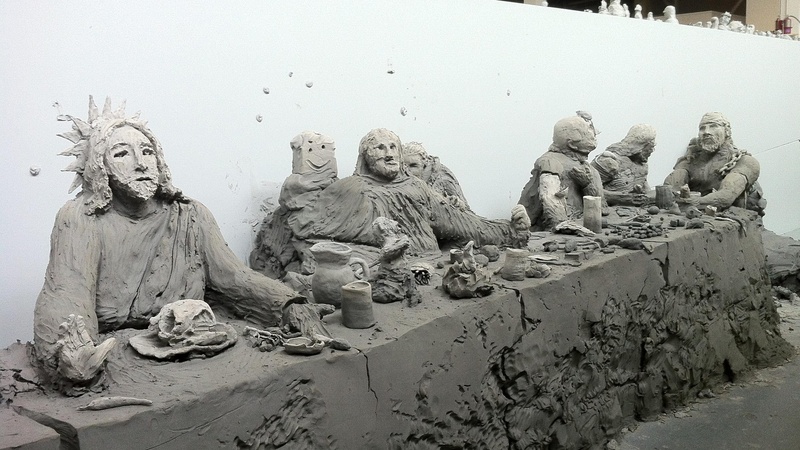 Going this Sunday to see the intentionally over-the-top Urs Fischer exhibition at the Geffen Contemporary, I was properly impressed by the crazy messiness of the whole enterprise, where hundreds of volunteers played with tons of raw clay. It was impossible not to giggle at the sight of the life size recreation of the "Last Supper," where a disciple rests a hand on the naked behind of one of his brethren. Being the very smart and very ambitious artist that he is, Urs Fischer made sure that a few of his own sculptures regally preside over the spread of the amateurish attempts of his admirers. His stunning recreation of the famous Giambologna sculpture as a gigantic wax candle keeps burning and slowly melting down until nothing will be left by the end of the show. And his monumental aluminum sculpture installed outside of the museum eloquently conveys the impression of an artist's hand shaping a clump of raw clay. I am not in a position to give advice, but if MOCA's architectural show will be cancelled, then an extension of this Urs Fischer exhibition might be a good solution to this problem. And let me finish with one Los Angeles museum show that doesn't make headlines, but in a quiet way reveals the depth and richness of its permanent collection. I am talking about the Norton Simon Museum's current exhibition, Beyond Brancusi: The Space of Sculpture. In one of the galleries, the interaction between iconic works by Donald Judd, Carl Andre and Robert Morris is so smartly conceived, you swear you could hear the conversation going on between these three artists.